Attempted Christmas Gift by Al Qaeda thankfully fails. So much for them unclenching their fist. U.S. officials say a Northwest Airlines passenger from Nigeria said he was acting on behalf of al-Qaida when he tried to blow up a flight Friday as it landed in Detroit. Rep. Peter King, R-N.Y., identified the suspect as Abdul Mudallad, a Nigerian. King said the flight began in Nigeria and went through Amsterdam en route to Detroit. The passenger was being questioned Friday evening. Both of the officials spoke on condition of anonymity because the investigation was continuing. The motive of the Christmas Day attack was not immediately clear. Wow, could the motive be the religion of peace still doesn't like us given the attempted terrorist's name and affiliation with Al Qaeda? Or maybe it was Northwest didn't serve food on the flight? Merry Christmas to my Christian friends and readers, and this scum's failure is a worthy new miracle for Christmas. As the Blogprof notes, Michigan's population has declined below 10 million He shows an excellent illustration of the break down of those leaving the state and those who remain, and its not a pretty picture and a nasty portent for the future of this state. Economic woes continued to force thousands of Michiganians to leave the state, leading the overall population to drop below 10 million for the first time since 2000, according to population estimates released Wednesday morning by the U.S. Census Bureau. The July 1, 2009, population estimate shows the state lost an estimated 32,759 people, the fourth consecutive year the population fell. Only Maine and Rhode Island saw their population go down in the last year. Michigan has been bleeding people since 2005, and at the heart of the decline has been the growing exodus of people moving out looking for work. The current estimate puts Michigan's population at 9,969,727, down from 10,002,486 in 2008. The state has seen a net loss of more than a half-million people to other states since 2001 -- a number that swamps the natural increase from a greater number of births than deaths. For years, the Mackinac Center has warned state officials that residents are fleeing for friendlier economic climates. They're going to opportunity states, where taxes and regulation typically fall lighter on the backs of business and families. Michigan could reverse this trend by lowering the cost of living, working and investing in Michigan. If you lower the price of nearly any good, more of it will be demanded in the market -- and vice versa. Unfortunately, Lansing's careerist politicians have served the system and their own interests, and people in part are voting with their feet against this. Among the price hikes our political class have imposed during the past seven years are a sneaky property tax shift hike; an 11.5 percent increase in the personal income tax; a 75-cents-per-pack cigarette tax increase; a complex business tax with a further 22 percent surcharge that extracts an extra $600 million annually from enterprises choosing to remain or locate here; several new occupational licensure, regulation and fee regimes; expensive renewable energy mandates and more. To add insult to economic injury, various members of the political class have proposed even more tax increases, including a job-killing $6.5 billion graduated income tax. Just the existence of such proposals can have the effect of driving people away if they rationally perceive a chance that such a thing might become law. It's not just the auto industry, people have been leaving this state before the present one-state depression, and the only thing that may slow the exit rate is the rest of the country is heading in the same direction due to Obamanomics. Michigan's leaders need to make this a low-tax, business friendly state or the decline will not be turned around. Hey, tax credits for the film industry worked, now how about tax cuts for business and the rest of us to get this state moving? elonies carry lacerating lifetime penalities for nearly 1.3 million people in Michigan. You read that right. One in every six adults in Michigan has a felony record, according to Michigan State Police records. When companies like Wal-Mart in Pittsfield Township exclude hiring any of them — no matter what or how old the conviction is — it sends the wrong message to the rest of society. Lifetime restrictions on employment make bad social policy and shortsighted business practice. They also raise serious legal questions, as the American Civil Liberties Union of Michigan noted this week. Of course once Wal-Mart starts to move away from this clear rule and then allowing some felons, expect tons of law suits alleging Wal-Mart discriminates by allowing some felons employment but not others. Perhaps the ACLU will argue that those convicted of theft crimes, drug dealing, or other nonviolent felonies should be allowed to work there. The perhaps they can expand the wedge and argue that violent felonies are ok as well as long as they're not "too" serious. As the ACLU notes, prohibiting all applicants with a felony conviction from obtaining a job also violates federal anti-discrimination law. Such policies have a disparate impact on African Americans. No one is saying that there are not legitimate reasons for not hiring people with felony convictions. But a blanket ban is unfair, unreasonable and discriminatory. Just wait until it is modified under pressure to a ban on some rather than all felonies and watch the lawsuits fly. It’s easier to get jammed up in the system than most people think. I recently wrote about a Detroiter and retired auto worker who was barred from nursing school, despite being an honor student, because of an almost decade-old case in which he caught a felony firearms conviction, following a routine traffic stop, for having his legally registered gun in a duffel bag on the back seat of his car. He was coming back from a shooting range. The solution to this real problem is to end the current proclivity of our lawmakers for making every misdeed, matter how trivial or harmless, a felony. Many acts should not be a crime at all, let alone a felony. Have fewer acts defined as felonies and you'll have less felons and you'll save resources to be able to deal with and focus on the actual dangerous criminals that are a far greater threat than some fellow who forgot to put his bag in the trunk on the way home. Don't blame Wal-Mart, blame the over-criminalization of society, brought to you by our legislatures. Its NIMBY tilting at Windmills. proposal to construct a massive wind turbine farm, capable of producing 1,000 megawatts of power, over 100 square miles of Lake Michigan, a few miles offshore from Pentwater and Ludington, has many residents howling. At a meeting in Ludington last week, residents gasped and jaws dropped when developers unveiled drawings showing 100 building-size turbines spinning within sight of Lake Michigan beaches. "Would anyone put these in the Grand Canyon? This is our Grand Canyon, our beautiful spot," said Pentwater resident Mary Stiphany, adding that the hulking turbines would obstruct views and hurt tourism. "It would be such an eyesore." The response is an indication that making the dream of alternative energy real in a spot as treasured as the Great Lakes may be harder than imagined. Renewable energy has consequences and costs too, and blocking some scenic views with one hundred to two hundred 35-story high wind turbines would be one of them. The again I'm surprised the people wouldn't feel wonderfully virtuous to gaze out on a massive farm of 200 spinning turbines in front of their formerly scenic beaches and lakescapes. Of course, a nice compact nuclear plant would take up much less room and produce more, and more reliable, power to boot. But we can't have that in this brave new green world. So with combined high-pressure tactics, outright bribery in order to rush through a multi-thousand page bil so obama can get a Christmas present. Of course rushing through a massive alteration of the way the nation handles health care leads to unintended consequences (unintended hell, if they weren't intendedm the changes wouldn't be in the bill!) such as the destruction of the Flexible Savings Account. How will health care reform impact my flexible spending account? Currently, the cap for contributions to flexible spending accounts is about $4,500 on average nationally, according to Save Flexible Spending Plans, an organization dedicated to protecting flexible spending accounts, also known as FSAs. But this cap is likely to drop to $2,500, as both the House and Senate bills lower the cap to that amount with the aim of helping the government collect more tax revenue. In terms of differences between the bills, under the House bill, consumers can’t use these accounts to pay for over-the-counter medications, while under the Senate bill, consumers can use the accounts to pay for such medications if they get a prescription from their doctor. In addition, under the Senate bill, FSAs will be included in calculating the taxes insurers (and ultimately companies and individuals) will be hit with if they offer more generous plans, which could further encourage employers to drop such plans. Of course this results in more taxable transactions and hence more revenue...any bets on whether its really an "unintended consequence". It used to be that before you ran roughshod over a major portion of the economy and passed laws to drastically affect everyday life for all Americans, that you'd take your time, analyze the possibilities and come up with something workable. Instead, it seems the Democrats are in a tizzy to get something, anything, shoved through the legislative process and into law and to hell with the unintended and very real and intended consequences. Yep, you never know how reliant you are on technology until it stops working. I confess I'm a crackberry addict, relying on it for emails and communication back to the office when i;m in court or elsewhere. So tonight, while there is a deposition set for tomorrow morning. The defendant's attorney who set it is now saying he won't produce his client, the plaintiff's attorney is saying he's going to show up there anyways, and I, representing the third-party defendant (The humble innocent being blamed by the defendant for all the evils under the sun of course), am left to figure out whether this thing is going to go or not. Did I mention Defendant just happened to produce 670 pages of long overdue documents responsive to discovery requests today at 4pm, just in time for his client's deposition upon the morrow? Of course while the emails are flying thick and fast regarding the schedule for the dep, the blackberry stops receiving them or sending. Turns out I'm not alone. There's apparently a nation-wide Blackberry outage. Clearly this thorny deposition problem will not be solved tonight, so the legal battle resumes tomorrow. Dr. Anne Schuchat, a CDC flu expert, stressed that parents don't need to do anything or to worry if their child got one - or even two - of the recalled shots. The vaccine is safe and effective, she said. The issue is the vaccine's strength. Tests done before the shots were shipped showed that the vaccines were strong enough. But tests done weeks later indicated the strength had fallen slightly below required levels. On the one hand, the article indicates the hundreds of thousands of doses are being recalled for losing their effective strength but don't worry "The vaccine is safe and effective". It is both safe and effective yet it is being recalled - does this make any sense? Or is this pronouncement something like "The vaccination was a success but the patient still got the flu". Wholesale and Core Inflation Up - Are We Looking At The Beginning of Obama's (and Our) Stagflaltion Woes? Yahoo news reports that the November wholesale inflation up more than expected. Greater than expected by whom? When you dump billions of dollars into the economy and deficit spend like there's no tomorrow, inflation is somewhat predictable. Inflation at the wholesale level surged in November, reflecting price jumps in energy and other products. The bigger-than-expected increase is certain to raise the attention of Federal Reserve policymakers beginning a two-day meeting on interest rates. The Labor Department says wholesale prices jumped 1.8 percent in November, more than double the 0.8 percent gain analysts expected. Core inflation, which excludes energy and food, rose 0.5 percent, the biggest increase in more than a year. A core inflation rate of .5 per month if it is sustained is a rate of 6% per year which is quite high, and a wholesale rate which includes energy and food if sustained would equal an annual inflation rate of 21.6%, and even if it returns to the lower expected amount of .8% would mean inflation of 9.6% per year. Let's see, unemployment in double digits, inflation going up in tandem with unemployment. The Obama administration keeps looking like Jimmy Carter 2 not just in foreign policy but now also on the domestic economic front. In a sterling example of a lousy victim selection process, five teen criminals attempt to car jack a Pittsburgh police officer. Officer Caytlin Wood had her engine running Monday afternoon before heading for the 4-to-midnight shift when she saw five teens behaving suspiciously in the Bloomfield neighborhood. She called for backup to investigate. Police say a 14-year-old boy demanded the car while pointing a gun at Wood, who was wearing a sweat shirt over her police uniform. They say the boy ran when Wood stepped out but she caught him a block away. They say backup officers caught the other teens, aged 14 to 17. The juveniles have been charged with robbery of a motor vehicle and criminal conspiracy. The 14-year-old boy has been charged with illegal possession of a firearm. Not only do they pick an armed law enforcement officer as a victim, then one of them gets caught by her after they all try to run away. Very Nice job on the part of the officer to not only defend herself but also catch the twerp pointing a gun at her, and let's hope she just cut 5 future criminal careers short. Obama has been fittingly referred to as "Gun salesman of the year", and those sales not only make their legal and responsible buyers safer, but they also benefit Michigan wildlife. The continued high-volume sale of guns and ammunition nationwide in the last year will lead to a big increase in funds for wildlife habitat and management across the country, including Michigan. A federal tax collected on firearms and ammunition sales is redistributed to wildlife and hunting programs in each state, and only three -- Alaska, Texas and Pennsylvania -- get more money than the $17 million Michigan is expecting this year: $6 million more than last year's record. With budget cuts and the coming merger of the state's departments of natural resources and environmental quality, the extra bucks will come in handy. Besides funding hunter education and wildlife management, the tax is used to lease land from farmers to give hunters access and to operate the state's 128 game and wildlife areas. Because Michigan has so many hunters and so much natural land set aside for hunting and wildlife it gets a nice portion of the excise tax. One reason for the rush is that many gun owners thought the election of President Barack Obama would usher in a new call for gun restrictions. Another is the popularity of concealed-weapon permits, like those in Michigan, that allow owners to keep firearms in purses or glove boxes if they have a permit. And there's also the broadening of the state law that allows people to defend themselves with deadly force, even outside their own homes. Guns are no longer taboo. Single moms, college students and even older women are buying them and learning how to use them, McMahon said. Given Obama's record on supporting over-the-top gun control including bans on ownership, combine it with a Democrat majority in the House and Senate and its no wonder people are stocking up while they can. I'm betting the Democrats will try to sneak some gun control laws including outright bans through between the 2010 Congressional elections and the 2012 Presidential election. Sadly, the Detroit Free Press misses a great opportunity to point out that this massive increase in firewarms purchases has not led to "blood in the streets", the "return of the OK Corral", or any other of the many canards of the media and gun banning movement. One can't have everything, and the article was decidedly less anti-gun than many a Free Press article has been in the past, so there is still hope for continued improvement. When you're running around dressed as cops and brandishing firearms and then kicking in doors, its a good thing to let the real police know, especially in Detroit. As movie cameras roll, a group of actors brandishing weapons is poised to kick in the front door of a house. A squad of police officers suddenly rushes into view, pistols drawn. "Get on the ground!" one cop yells. "Don't move!" The actors are playing a part; their weapons are fake. But the cops -- and their guns -- are quite real. This scenario has played out twice in Detroit in recent weeks, when film crews shooting scenes involving weapons were mistaken for real criminals by police because the moviemakers hadn't obtained the proper permits from the city. The company had applied for a permit through the Mayor's Office. The confusion occurred because the application was for Nov. 6 -- a day after the crew filmed at the northwest side home of actor Jermaine Allen. Being a day early could have had some serious consequences, for now its only a misdemeanor ticket for possession of and brandishing facsimile weapons. Luckily no one was hurt this time, and next time, hopefully they'll get a permit for the right day. Reverse: Zeus seated holding a spear in one hand and Nike the goddess of victory in the other. Inscription: Basileos Antiochou Theou Epiphaniou Nikephorou - Of King Antiochus God Made Manifest Carrier of Victory. Sadly, such a fine silver tetradrachm is not yet in my collection but its on my list of coins to eventually acquire. A Greek coin, but also an impressive and tangible link to Jewish history, especially at this time of the year. Hanukkah, the Jewish Festival of Lights is a celebration of liberation from tyranny, and its about the liberation of Israel from the rule of Antiochus IV Epiphanes. When the Hellenized Assyrians, led by Antiochus Epiphanes IV attempted to force the Jews to worship Antiochus as a god, such worship the Jews, led by Judah Maccabeus took quite an exception and led an uprising against the Syrians starting in 165 BC which eventually drove them from Israel and led to the rise of the Jewish Hasmonean dynasty from the Maccabees descendants. The victorious Maccabees reclaimed the temple and purified and rededicated it. The story of the lamp oil supply only enough for one day that ended up lasting for 8 days until more purified oil could be obtained is a later addition to the story. Its the reason the Hanukkiah (Menorah) with 9 candlesticks with eight of them representing the eight days and the other the watchman candle that lights them. The story was added to change the focus of the story of Hanukkah from a military victory to a more spiritual one. Regardless of the veracity of the story of the oil, it is a fun holiday and a good way to remember a historic Jewish victory over more numerous and better armed enemies. The tasty latkes (fried potato pancakes) and sufganiot (fried dough topped with powdered sugar) along with gifts for the kids only sweetens the memory of that historic victory. senior State Department official said Friday the U.S. expects Pakistan to deport five young Americans detained after they allegedly sought to join up with terrorist groups and left behind a video saying fellow Muslims must be defended. The State Department official said Friday that it is not yet clear whether the five men may have broken any Pakistani or U.S. laws during their stay in Pakistan. The five allegedly told local investigators they were trying to connect with al-Qaida-linked militant groups and intended to cross the border into Afghanistan and fight U.S. troops there. Police have said those detained included three Pakistani Americans, two Ethiopian Americans and an Egyptian American named Ramy Zamzam who is a dental student at Howard University. The others were identified as Waqar Hussain Khan, Umer Farooq, Ahmad Abdul Minni and Aman Hassan Yamer. Pakistani officials have given various versions of their names and the spellings could not be confirmed. Farooq's father, Khalid Farooq, also was detained. Pakistan police officials say the elder Farooq had a computer business in Virginia and shuttled between the U.S. and Pakistan. Thursday the five men wanted to join militants in Pakistan's tribal areas before crossing into Afghanistan. He said they met representatives from the al-Qaida-linked Jaish-e-Mohammed militant group in the southeastern city of Hyderabad and from a related group, Jamaat-ud-Dawa, in Lahore, but were turned away because they were not trusted. Sad, not even trusted enough to join the second-stringers. While Pakistani officials have said the men admitted trying to connect with militant groups, an FBI note sent to American lawmakers said the bureau has "no information linking them to terrorist organizations." This is hardly reassuring. Then again, given the pressure by organizations like CAIR to hamper the FBI from investigating radical Islamists in the US including in their radical mosques, its not surprising. how many more like these five are out there (not to mention what will be done to keep track of them once they are deported from Pakistan) and what's the FBI doing to stop them bringing jihad to the USA? How many made their jihadi pilgrimage uninterrupted, and will they be caught before they try and reenter the USA? Against the Zionist Enemy or just more Arab games of Aliens v Predator? Solomonia reports that the Al-Aqsa Martyr Brigades (one of the implausible deniability wings of Mahmoud Abbas' Fatah in the Gaza strip are forgoing buying food for their kids so they can spend the money on weapons. the renewal of the threats emanating from the Zionist military establishment to carry out a new attack on the Gaza Strip... the Al-Aqsa Martyrs Brigades... warned of a harsh and painful response that the occupation state is not expecting. What's the odds that the whole "threats emanating from the Zionist military establishment" is just a pretense to cover Fatah purchasing weapons to be ready for the next go-round with Hamas for control of Gaza? After all, it was according to the article Hamas that confiscated their weapons from them the first time. I blame the Copenhagen Conference. Every time politicians gather to pontificate about the peril of Global Warming and how the earth is heating up we get cold weather, typically with snow. It seems that CO2 emitted by politicians in the form of masses of hot air has a damaging cooling effect upon the earth. Of course, discovering that the scientists are cooking the data to make cooling trends appear to be warming trends to fit their conceptual model that the earth is warming isn't helping either. Adding the news of the EPA announcing they are treating CO2 as a pollutant harmful to humans due to the threat of global warming is the ice on the cake so to speak - a sure sign we're in for a rough, cold winter. Police on Monday said a woman saw the man walk away from her car with a drill she bought. Officers followed footprints to an apartment in the community about 30 miles west-southwest of Detroit and heard people inside arguing about stolen property. . . .officers searched the apartment and didn't find the drill, but identified a man who fit the suspect's description and whose shoe size and tread matched footprints left in the snow. Police detained the man and followed another trail of footprints from the apartment to a Dumpster, where they recovered the drill. Allison Coss and Scott Sippola were arrested Dec. 3 on an extortion charge at an airport near Marquette, 450 miles north of Detroit. An undercover FBI agent posing as a representative of Stamos had arranged to meet them there. . . During a search of a Marquette home shared by the pair, the FBI found pieces of paper with Stamos' cell phone number and the names and phone numbers of three tabloid magazines. A homeless shelter operator who lavished nonprofit money on funds controlled by former Detroit Mayor Kwame Kilpatrick and other politicians faces a possible two-year prison sentence after he pleaded guilty Tuesday to a felony tax charge. Jon Rutherford, 60, of Orchard Lake, who headed the nonprofit group Metro Emergency Services Inc., was indicted in 2006 along with his former controller, Judith Bugaiski, 51, of Sterling Heights. Rutherford and Bugaiski are to be sentenced May 20 after each pleaded guilty to a five-year conspiracy charge in front of U.S. District Judge Marianne O. Battani. Among the allegations was that Rutherford diverted about $750,000 from his Highland Park homeless shelter to make illegal political donations to Kilpatrick and others. Rutherford allegedly pumped tens of thousands into Kilpatrick's nonprofit, the Kilpatrick Civic Fund, and paid tens of thousands in consulting fees to the former mayor's father, Bernard N. Kilpatrick. "To the range to make sure everyone behaves safely"
"Why, are all the people there goofballs?" Yes Abby, there are some goofballs, but luckily not too many showed up last night. 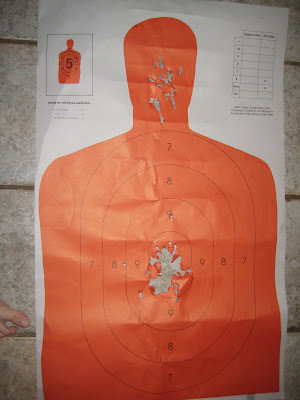 The range on Sunday nights is open to the public and you occasionally get some types for whom firearm safety is not just on their priority list, its often a completely foreign concept. Of course, the second RSO scheduled to be there didn't show up so I had to run things on my own, and of course, clean up and shut down the range on my own as well. So I get there early to setup and of course the keys are missing from the clubhouse. They don't trust the range officers with keys, we have to go sign them out from the staff at the clubhouse. Grand. Luckily the Chief RO is hanging out at the bar and gives me his keys - note the status differential - Chief RO keys, everyone else, no keys. So I open up, get the lights on and the blower going and get the range ready to go. A few group of three people show up just to look around as I'm setting up and when I tell them its open to the public and they can shoot they're quite happy. They turn out to be IDPA shooters so I'm happy - excellent understanding of safety and good gun handling skills equal no holes in the walls, roof, floor or most importantly any person. A few members show up and shoot, a few more non-members show up and the night goes on, a few tips on safety are distributed by yours truly as the hours go by. An RO not on duty comes in to shoot and he spells me and lets me shoot a bit. I put 100 rounds through my CZ-82. It was just as reliable and accurate as before. I had gone in on a purchase with two friends of 1000 rounds of the Silver Bear 9x18mm Makarov hollow points and wanted to see how they did. With a Muzzle velocity of 1,000 F.P.S. and Muzzle energy of 255 ft.-lbs I expected them to be pretty zippy (a technical shooting term), considering a .38 special+P has a 945 velocity and 248ft.-lbs. They were a bit sharper than the Wolf 9x18 Makarov FMJ I had brought along for comparison, but no hurdle to shooting accurately and quickly. However, they had another interesting feature. The Silver Bears had a huge muzzle flash. From the sight picture it looked like massive sparks erupting from the gun with every shot. The other RO certainly noticed the huge flash from them. Part of Russian secret defense technique - if hollow point doesn't stop them, set them on fire comrades! The Wolf FMJ by comparison had very little if any flash, at least from the shooter's point of view. Basically, while the 9x18 may not be the end-all be-all defensive cartridge, considering you can accurately empty 13 rounds from a CZ-82 very accurately and rapidly, I'd think it would be quite adequate to stop an attacker, but I'd recommend sticking to the Hornady 9x18 hollow points for self defense, unless you like flame throwers as a carry item.